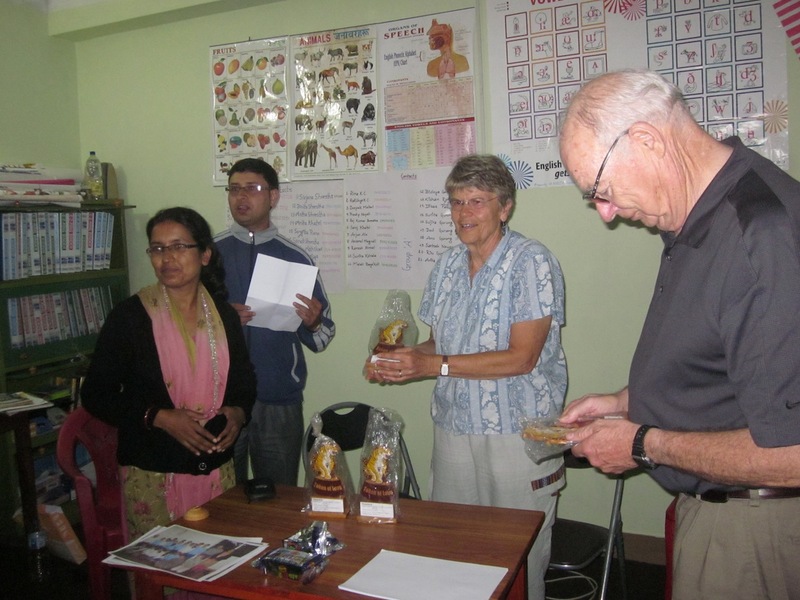 I just returned from Butwal, my final technology outreach visit before we depart Nepal. It’s a hot, dusty town near Lumbini, the birthplace of Buddha. These sorts of trips are never convenient nor easy, on a number of levels, but the end result is always worth it. The students and teachers are inspiring and I come away enriched. I think I finally got it right: the near-perfect combination of engaging, educational, and fun. Because I have been so swamped by my EdTech courses and other efforts, I haven’t taught the Access students as much as I would like. I was thrilled to meet with them again and see how much their English skills have continued to improve. They are awesome. I’ve said before that they are great students: motivated and respectful. They are warming up to me, which means they are more willing to talk, discuss, and answer my questions. I’m also getting less nervous which helps. They work really hard, and I mean really hard. Tomorrow is Saturday, the only day off public schools in Nepal. It’s their only day to sleep in and yet they will meet for their Access class at 6:00. That’s a.m. Motivated! That’s in addition to coming after school during the week for 90 minutes each class. They told me tonight in their government schools they attend during the day there are between 50-70 students per class. It must be refreshing to be in a small class of only 20! Their classroom is simple but fully functional. Its walls are covered by their recent writings and holiday drawings. Today one wall showcased handmade Valentines cards, since they also learn about American culture and holidays. Often they start the class by singing, “She’ll Be Coming Around The Mountain” or “Oh, Susanna!” It’s great. I’ve tried different things with these students along the way. Some have worked, some haven’t. It’s always a struggle to figure out what I can teach that will really help them. None of them have computers at home. They have limited time at the Cyber. I think I’m finally on to something. I decided to use technology directly related to their field of study: English Language Learning (ELL). If you’re wondering why I haven’t thought of this before, I have. I’ve tried. But this semester I’ve designed some technology integration strategies for ELL students that I thought might prove beneficial to them. I began with what is, in my opinion, one of the best iPad apps released to date: The Fantastic Flying Books of Mr. Morris Lessmore. This is an app that demonstrates what is truly possible with a tablet. It’s a phenomenal blend of video, eBook, interactivity, and sheer genius. If you haven’t experienced it, you really should. I used it to prompt a discussion on how they think such an app could help them boost their English language skills [it shows text on each page while it reads]. Next, I asked them to reflect on learning English for the past 15 months and rank the following concepts from hardest to easiest: conversation, writing, grammar, speaking, and vocabulary. Both classes marked grammar as the hardest with vocabulary as a close runner-up. Easiest was writing and then conversation. I was thrilled with their responses because the two hardest tasks, grammar and vocabulary, are the easiest two to support through technology. How exciting! My mind began racing with ideas for future implementation. I divided them up, sending half off to the four computers in the next room to explore websites listed on their worksheet. The others stayed with me and we explored some fun apps on the iPad. They loved it! Everyone had a chance to interact with the iPad, which takes them all of one second to figure out. Just for fun I tried some really basic apps that I use with my young children. I took care to explain that even though I knew these apps are really easy and below their level, which they are, I still feel it’s helpful to hear native English speakers (which they hardly ever do), practice pronunciation, and review vocabulary. We practiced animals and colors using Fun English and Flashcards. They giggled and laughed and competed against each other. It was great. Then I moved up to SpeakingPal, which allows them to listen to a quirky video conversation and complete a quiz. This was more on their level and they enjoyed trying to beat their previous score. Just for fun, I tried a speech-to-text app called Dragon Dictation, which really struggled deciphering their accents but gave us all some good laughs. If we had time, I threw in a few extras (like Stack the States and Scribblepress). Time flew by, they were active, engaged, learning, and having fun. I came home feeling like in some small way, I had made a difference. As always, the honor is mine. P.S. These are their new bags — aren’t they great? They gave me one too! It is beautiful country and has many resource of water and wonders. It is just like a heaven. It has Mount Everest which is highest mountain in the world. So I love Nepal and I proud of my Nepal. I love Nepal because I born in Nepal and all my family live in Nepal. It is smaller than America but it is so simple and beautiful. I like my country very much. It is a country full of natural beauty and greenery. It is the place where Lord Buddha was born. It lies in the lap of the Himalayas. There is many kinds of temple. In Nepal is many forests and rivers. In Nepal is very lovely place. They love each other. Nepal is my born place. Nepal’s people have Nepal’s aim. In Nepal every person lives together and helps each other. There are many kinds of festival. I love Nepal because Nepal is one of the most beautiful country in the world. All love their birthplace and I also love my birthplace Nepal by heart. The culture of Nepal is many and different, but by being different culture, the pople of Nepal never fight in name of culture but all the people share their culture to each other. Nepal is an example of peace and friendship. So, I love and never forget my beautiful country Nepal. It’s my birthplace, where I get birth and enjoy every moment of my life. As well as many love of my parents it is one of the historical and important places of Nepal. People follow heir traditional culture. The are cooperative and it’s full of natural heritage. It’s so peaceful. There is unity. All the Nepali people came to Gorkha and pray for their long life. I’m very lucky because I got opportunity to learn about English language and American’s culture. I like American’s country very much. Very beautiful. If I got the chance to go to America I feel I’m very lucky in the world. America has different culture. There’s language, style of sit, style of eat, style of clothes. I love it. I’m fan of America. So I love America. There are many facilities. We can spend better life there. Is like a god because America helps to read at any cost. No any countries has been helping this way. America is my future. And many many love for you. So, maybe the whole world is in my bag after all. It’s a little strange being a walking Apple store in the middle of nowhere. I’m 5km from India’s border in Bhairahawa, surrounded by mammoth mosquitoes, mud, and heat I haven’t felt for weeks in Kathmandu. In my luggage I have enough technology to set up my own shop on the corner: an iPad, laptop, iPhone, speakers, portable battery-operated color printer, HD projector the size of my iPhone, camera, Flip HD camera, and the cords/memory cards/batteries/cables that go with it all. Amazingly, I am without four things I really need: an umbrella, ball point pen, earplugs, and mosquito repellent. As I write I’m devising a plan to ward off the mozzies in my room to avoid dreams of malaria dancing in my head while I sleep. So far I am still wearing my scarf and long socks from this morning’s crisp Kathmandu air even though it is roasting. I like a protected neck and toes. Festival music blares and beats so loudly It feels like a small earthquake on my thin mattress. I am here to teach another group of ACCESS students about technology. This is a fun but in no way easy assignment. These are kids who struggle for the basic necessities of life and who come from several surrounding villages to receive 5 hours of English language per week. They all make great sacrifices to attend but feel it a great honor to learn English. I had an hour and a half with two classes of 20 students each to teach them everything I could about technology. I spent a lot of time thinking of what I could teach them that would be useful, applicable, and interesting. But in the end, as usual, they are the ones who taught me. If any of your American kids need a lesson in respect, I have the perfect place to send them. 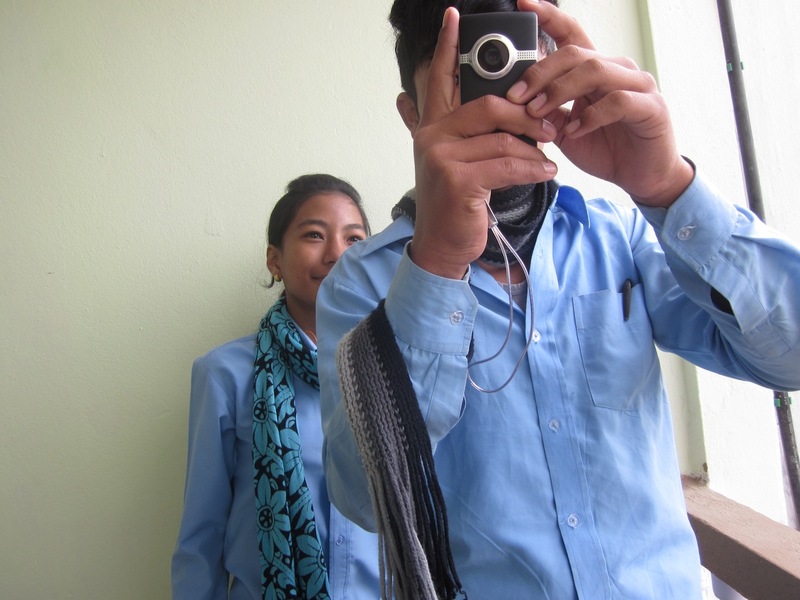 They didn’t enter the classroom until formally invited in and then greeted me by name and ‘Namaste’ as they entered. Each student gave me fresh-picked flowers. Forty bouquets of flowers! If I handed them a piece of paper or quiz, they stood to receive it. They did not make a sound and listened intently to every word I spoke. When called on to speak they stood and spoke clearly. They kept eye contact. They sang me two welcome songs: “Oh Susanna” and “She’ll be coming ’round the mountain.” One boy read a poem he had written. In case you missed the memo, these are teenagers. Hence the challenge. What could I possibly teach them? I mean, only four of the 40 have ever even used a computer. Briefly! A room full of teenagers who have not once in their lives sat down at a computer! I revised my game plan based on what I have learned from my other teaching experience with ACCESS students and in the end I think it was my most successful mission yet. So what did I do? Well, what would you do? I started somewhere. I introduced myself using a multimedia Keynote presentation on the projector (with speakers). I told them I had two objectives with it: one, to introduce them to an American; and two, to show them how in just a few minutes technology could help them learn about something they otherwise knew nothing about. In this case, me. I showed them a trailer I had created of the Teej celebration in Kathmandu, and a trailer my son made of our India trip. They loved it! There is something energizing about a darkened room and watching, hearing, and feeling something on a big screen. It’s not on their daily agenda here. I gave them a short quiz on 5 technology terms and went over each answer. I demonstrated a network and the World Wide Web by using yarn strung around the room. The best part that I incorporated this time was to divide them into groups and let each group play with a tool. I gave one group the camera and watched as they went from holding it backwards (I’ve got some great close-ups of noses) and pushing the wrong buttons, to zooming in and taking a decent picture. They had me pose in a dozen ways, holding this bouquet of flowers or that one. My smile muscles are sore. Another group took the Flip and disappeared outside. I caught glimpses of them enacting scenes and narration and can’t wait to look at the footage. They were quite the drama stars. I gave the last group the iPad. That was a huge hit and confirmed my knowledge of how intuitive it is. It took them about a minute to figure it out and they were trying out different apps and each vying for a turn to swipe and tap. Thanks, Steve. Isn’t that what we all enjoy, the chance to play and tinker with gadgets? Before the students arrived I spent a few hours with the four English teachers. They are educated people who want to help these students learn and do a wonderful job. While much of our time was spent trying to get their Internet up and running, even though I insisted we would be fine without it, they were eager and willing learners. I showed them some of the power behind Google docs and they want to create a class blog. I think they will. See what I mean? They teach me. I had the opportunity this past weekend to visit a small town called Gorkha, about 6 bumpy, dusty, cliff-clinging hours outside of Kathmandu. It was my first time out of the Valley, and I was thrilled to breathe again and be in the mountains. My mission was to teach a group of ACCESS teachers and students about technology. 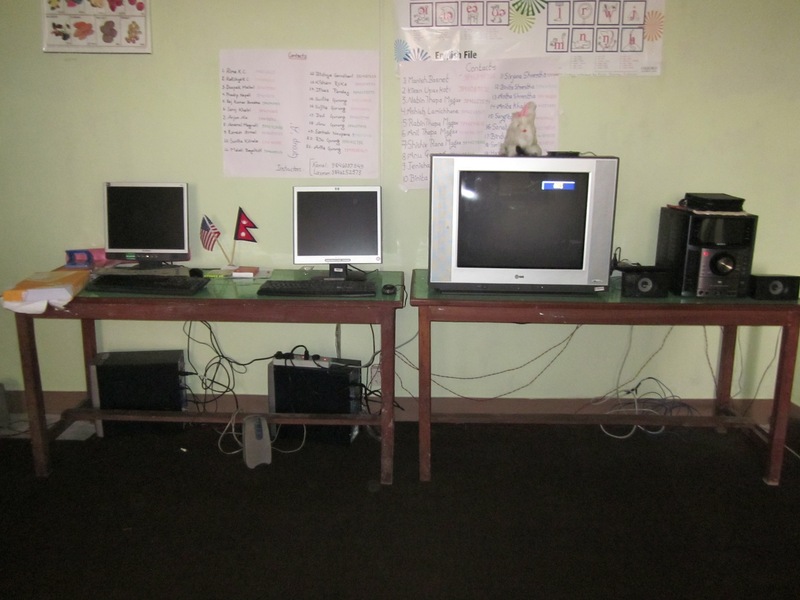 This was no easy task, considering most of the students have never used a computer and Internet access is extremely limited. 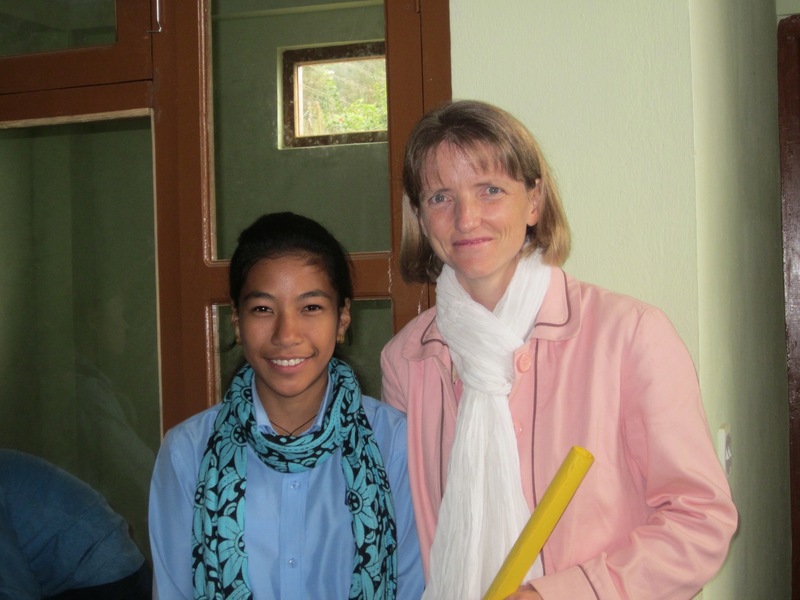 In addition, these students are learning English, so their skills are emerging. It was a challenge, but a fun one, and in the end was enriching for all of us. The teachers were amazing. They teach English classes to these students, college courses to other students, volunteer large amounts of time, and juggle various professional pursuits. They were well-equipped with computer skills and were willing and gracious learners. I helped them explore Google docs and they were sold immediately on its practical application. We exchanged ideas and I felt an immediate connection with them and an appreciation for all of their efforts. It is a real challenge to incorporate technology into learning when 1) you don’t have the technology and 2) you don’t have the Internet. Yet, they are trying and hoping to head in that direction soon. I took my aunt and uncle, who happened to be in town and who are retired professors. They were great sports to make the journey. Word spread fast, and before we knew what we had gotten ourselves into, we were the “distinguished guests” of a panel in front of a room full of teachers that had come from all over to hear them speak. 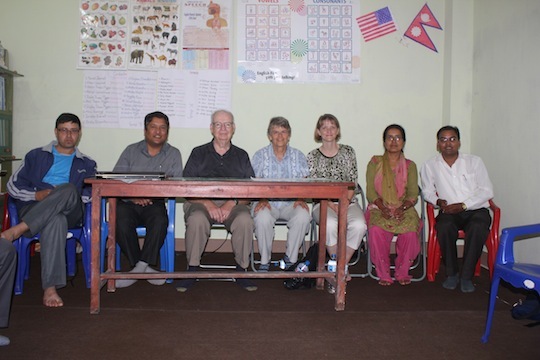 Though we were slightly unprepared, a lively discussion ensued and participants asked great questions about the differences of Nepali and American education systems, curriculum, outreach, and teacher training. 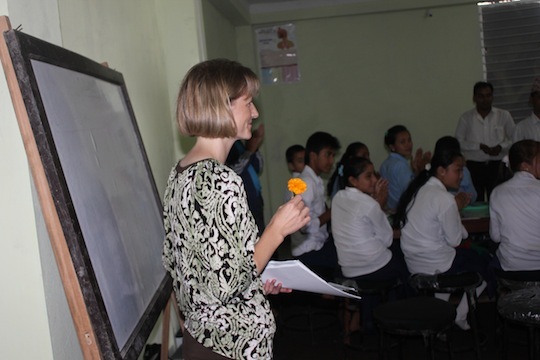 We were even presented with a “Token of Love.” I led a few sessions with the students, and I immediately realized I wasn’t prepared. Their English skills were more limited than I anticipated and few have ever used a computer. The quiz I prepared on Internet 101 was too hard. So, I went to plan B. I pulled out my iPhone-sized projector, pop-up speakers, and iPad, and showed them some multimedia on the wall. I introduced myself and hometown of St. George, Utah, through a Keynote presentation, and showed them an iMovie trailer of their counterparts in Kathmandu. We talked about the usefulness of technology, a little about netiquette, and I challenged them to learn all they could. They are great students: eager, willing, and polite. We gave them some practice with a camera and printed out some photos for them. They enjoyed that. 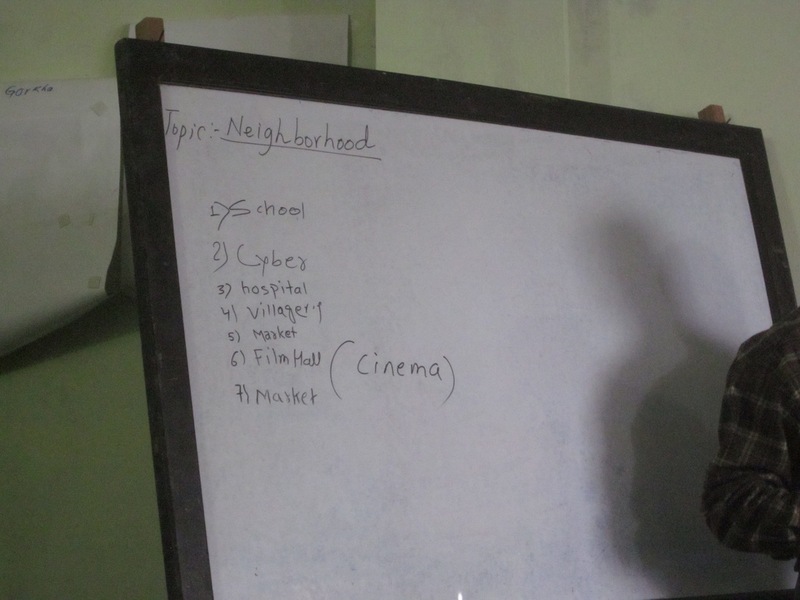 The first class I observed was about neighborhoods, and I enjoyed their list of their neighbors on the board. While it was all a wonderful experience and I made some great contacts and connections, I came home a bit troubled. I truly believe in using technology and its power to enhance and further educational experiences. Computers and the Internet are valuable tools, nearly indispensable. But for these students, it just seems so unattainable, so unreachable, so far away. I have to ask myself, will it even help them? Do they really need all of the fancy tools and applications that most of us rely on? I’m torn, knowing that the answer is both a resounding YES and a cautionary no. I’m content knowing that they are learning English, receiving an education, and are empowering themselves to really make a difference in their lives. In the end, that’s what really matters. The rest will come, in its own time. I had an opportunity this week that very few people ever get, especially if you live in America. For an hour and a half, for two separate sessions, I taught 40 teenagers Internet basics. What’s so unique about this? Well, many of them have never used a computer or the Internet. At all. Ever. Now that’s cool. I’m not even a teacher by profession, but my setup with these classes would make any middle school teacher jealous. Partly because of their culture, and partly because they are the recipients of a unique opportunity to learn English, these students are ultra-respectful and gracious. Each one greeted me as they came in the room with, “Good afternoon, ma’am.” Each one looked me in the eye as they left and said, “Good evening, ma’am.” They started their class with singing. I’m not talking barely moving their lips, self-conscious singing. These students were singing to their heart’s content. Every one of them, boy and girl. They sang “Oh Susanna”, “I’ve Been Working on the Railroad”, and a moving song about overcoming and being strong. I was moved. 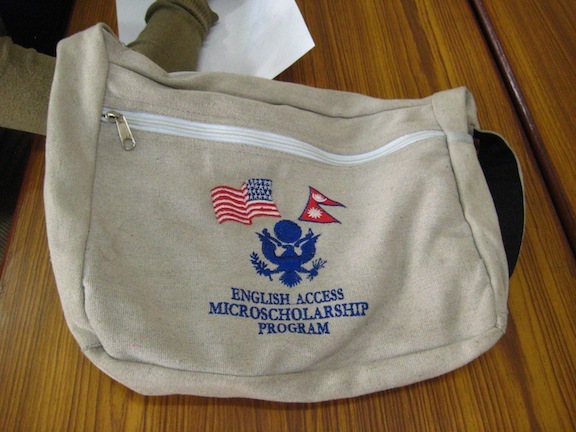 These students are part of the Nepal ACCESS program that provides them with the opportunity to learn English and other parts of American culture. For two years, these students meet together after their normal school (which in Nepal they attend 6 days a week for long hours). They even meet on Saturday, which is normally the only day off students have. They come from underprivileged, difficult backgrounds, but you would never know it. Their eyes shine, full of light, and they WANT to be there. At the beginning of the program in February they spoke little to no English. Now they are flourishing. So, I volunteered to teach them roughly once a month about technology. This is what I love and what I’m passionate about. Fortunately, this is a topic that teenagers anywhere are interested in, so I didn’t have to pull teeth to get their attention. In fact, you could have heard a pin drop in that room. All eyes were on me, and I had their complete attention. No texting or talking in the background. No murmurings or whisperings. Nothing but a ready and willing audience. So, I taught them! 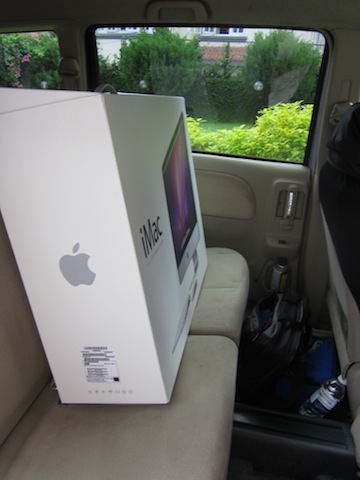 I am still waiting for a projector that will allow me to use my iPad for instruction, so I did the logical next-best choice: I packed up my entire 27-inch iMac into our small car, drove it through insane traffic and bumpy roads, carried it up 3 flights of stairs in the monsoon rain, and put it on the table. It definitely piqued their interest. How could I talk about technology without letting them see, hear, and experience it? I was in my element, teaching about something I really enjoy, and we had a lot of fun. I showed them a movie trailer I made using iMovie and footage I took of them during their Teej festival. They loved it. These are kids who probably don’t even own a single photo of themselves. They oohed and awed over the screen as they watched themselves sing and dance and recite poetry. I gave them a quiz on Internet basics and we went over all the answers. My assumptions were correct in that they don’t know very much at all. I really feel, which is why I am doing this, that teaching someone about how to access available tools is empowering. For them, the Internet provides knowledge about the world. It levels the playing field a little, giving someone in Nepal access to the same information that anyone else in the world has. It’s about opportunity, providing them with skills that will open doors and change lives. It’s also about confidence, as their skills and knowledge increase, they become more confident in their ability to help others. I’m not sure what I’ll talk about next time. They want to know how to use Facebook, Skype, and email. I’ll teach them about Google Docs, because it is such a great resource, especially for someone who doesn’t have a computer and software of their own. I’ll help them use various search engines to access information, talk about netiquette and staying safe online. We’ll take and edit photos and videos. In the end, though, I think they will be the ones teaching me. This week’s challenge in EDTECH 502: Internet for Educators was multi-fold. First, we were to research basic Netiquette principles with our specific students in mind. This is timely for me, since I plan to teach some of these things to my ACCESS students next week. After completing my research, I designed and wrote the XHTML and CSS code for my website. This was my first use of a callout box (the box that floats right on calls attention to key points) and other typographical specifics. It was rather grueling, and everything is very new to me. I suppose it’s a bit like learning a new language. Hopefully some of the repetitive tasks will get easier and more routine over time. This is a picture of my page as I first published it. I’m sure I will adjust and adapt as my skills improve, so I wanted to capture it as is. Here’s a link to my current Netiquette page.